Daily Illuminator: All That Glitters Is Great! December 18, 2015: All That Glitters Is Great! One of the most-popular supplements for GURPS Dungeon Fantasy has been GURPS Dungeon Fantasy 8: Treasure Tables . . . and for good reason! Folks love conjuring their own loot out of nothingness, with little else but the roll of some dice. However, sometimes you want more. And we're here to help. 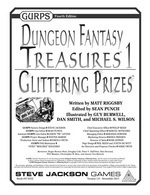 With GURPS Dungeon Fantasy Treasures 1: Glittering Prizes, Treasure Tables author Matt Riggsby is back to offer additional options for generating loot. Don't let your coins be humdrum; alter their shape, size, composition, embellishments, and more. Use paper money, shells, or even rai stones as rewards! Harness the power of magical coins. And discover other captivating currency characteristics. The volume also includes insight into money matters, such as the troubles of accurately counting coins, the risks of cursed hoards, and more. Cash isn't just a way for heroes to keep score; it can also be a great reward on its own, and even a gateway to further adventure! Download Glittering Prizes today, and treasure it forever.